Provided photo The top three finalists of the Miami East-MVCTC FFA Chapter Corn Contest were, left to right, Lauren Wright, Samuel Sutherly and Paige Pence. CASSTOWN — Recently, members from the Miami East-MVCTC FFA Chapter were challenged to participate in the annual Chapter Corn Contest. The rules of the contest were to bring in one ear of corn and earn a corn-related prize. All participants got a can of soda pop because corn syrup is a major ingredient. Overall winners were presented an FFA sweatshirt from the FFA Chapter. A winner was chosen based on the predicted yield of the corn. The grand prize winner was determined by the highest yield estimate, based on plant population per acre. Agriculture Education students in Plant and Animal Sciences took time in class to figure the predicted yield of corn ears as part of their continuing education of agronomy. The overall winner was Paige Pence. Her corn was predicted to yield 308 bushels to the acre with a 35,000 seed population per acre. Her corn was a DeKalb product. Second place went to Samuel Sutherly, who presented an ear of corn that is predicted to produce 303.6 bushels per acre with a 34,500 seed population per acre. His was an AgriGold product. Third place went to Lauren Wright with an ear of corn predicted to yield 290 bushels to the acre with a 32,000 seed population per acre. Hers was an AgriGold product. Participants included Elizabeth Bair, Michael Bair, Abigail Covault, Kearsten Kirby, Evan Massie, Paige Pence, Emma Sutherly, Samuel Sutherly, and Lauren Wright. 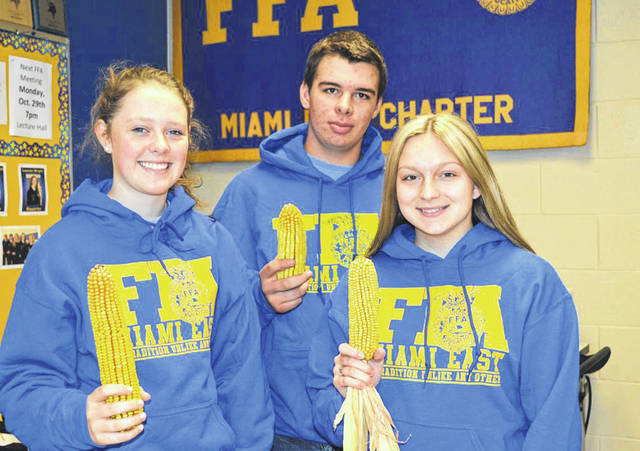 https://www.dailycall.com/wp-content/uploads/sites/30/2018/10/web1_Corn-Contest.jpgProvided photo The top three finalists of the Miami East-MVCTC FFA Chapter Corn Contest were, left to right, Lauren Wright, Samuel Sutherly and Paige Pence.